Excellent multipurpose blade cuts multiple materials. Produces straight cuts with a good surface finish. T-shank design for maximum grip and stability which fits 90% of all current jigsaw makes and models. 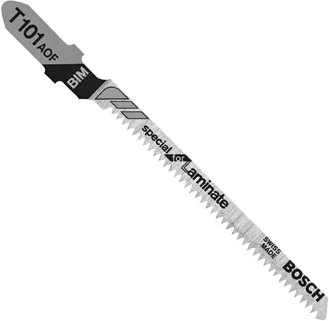 Application Wood with nails, plastic 1/8" - 1-1/4", non-ferrous metal and aluminum 1/8" - 1/2"
T345XF100 Progressor for All Purpose 5-10 Progressive Teeth Per Inch 5.25 100 Thick and thin materials like wood with nails, plywood, particle board 3/16"-3-5/8", metal 3/16"-3/8", non-ferrous metal and aluminum 5/64"-1-1/4"
T345XF3 Progressor for All Purpose 5-10 Teeth Per Inch 5.25 3 Thick and thin materials like wood with nails, plywood, particle board 3/16"-3-5/8", metal 3/16"-3/8", non-ferrous metal and aluminum 5/64"-1-1/4"
T111CF Accurate for Wood with Nails 8 Teeth Per Inch 4 5 Wood with nails, OSB, plastic 3/16" - 1-1/4"